Vinegar production allows us to interact very closely with our growers. The versatility of fermentation allows us to work with a wide variety of crops, utilize 'ugly' seconds that would otherwise go unsold, buy in bulk during seasonal gluts, and support the best and most responsible farmers. Simply put, we never have to compromise the provenance of our ingredients. The overwhelming majority of our inputs comes straight from the following short list of farms. Seven generations farming the same plot of land and a passion for green growing practices make Three Springs a local leader in sustainable fruit farming. The high humidity in the mid-Atlantic provides plenty of pest and fungus pressure; learn more about how Three Springs deals with it on their Growing Greener blog! As one of the first certified organic farms and one of the first CSA operations in Maryland, One Straw blazed a trail for countless farmers to follow. They farm over 100 acres of incredible produce, pigs, and eggs, proving to the haters that we can feed the world with good practices. 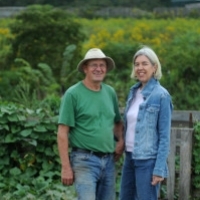 Producers of fantastic squash, kale, tomatoes, and more. We are making it a tradition to hound these growers for all of their big, ugly, ripe and overripe, high-sugar heirloom tomatoes every August. The name says it all. These farmers specialize in one thing, and they do it well, and it is organic. Without them, we might never have started production on the aronia berry vinegar, which has become one of our all-time favorites. A wonderful farm with a site in PA and another in NJ, Blue Moon Acres has always impressed us with their ability to grow high quality organic produce (and upland rice!) with some serious volume and accessibility. We enjoy using their rice, ginger, and turmeric. Miracles happen on this farm. The family behind these 80 acres has found a way to produce high quality high protein wheat where experts said it couldn't be done, grow rice on dry land, and do it all while maintaining the highest organic and quality standards. We rely on Next Step Produce for grains for our koji, sweet potatoes, and sunchokes. Geechie Boy is a little outside of our usual geographic range, but we cannot resist the excellent Carolina Gold rice and Sea Island red peas that they grow. 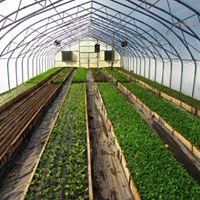 The farmers at Sunnyside Farm grow grass-fed and -finished pigs and cows, free range laying hens and broilers, ducks, and even organic flowers. We don't buy much from them for the vinegar, but our facility is located on this farm! While our mission is to support the best growers, we will occasionally plant a row or two of our own produce to ferment.